Chengdus & Don'ts: Score! My Guo Kui Bing Man is Back! Score! My Guo Kui Bing Man is Back! I was pleasantly surprised when I drove down Yulin Xi Jie 玉林 西街 where the infamous Guo Kui Bing 锅魁饼man parks his little cart. I had been going down this street every week since Chinese New Year dreaming of eating his soft and slightly crisp pancakes. Yesterday I got the best Valentine's gift of all, he was back and ready to make me some fresh guo kui! He is not a local Sichuan person. He actually comes from An Hui province in the Northeast of China. He just returned from a 20+ day stay over the Chinese New Year. I told him I have never had better guo kui in China and he told me it was because he uses special flour that he buys from An Hui. I wonder what makes there flour so special??? 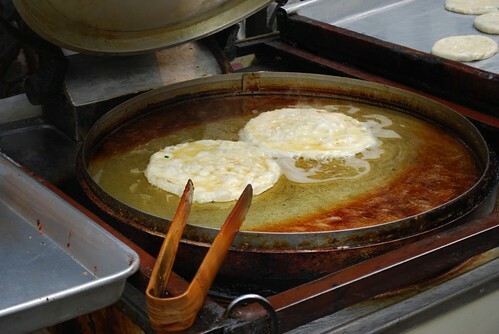 The beautiful cakes on the griddle, sizzling in hot oil. They consist of flour, egg, scallions, and I suspect some type of leavening agent. He prepares several pieces of dough in baseball sized balls and rolls them out right before he throws them on the griddle. After they are fried on both sides he gives you an option to have him put a shellacking of his homemade la jiao jiang 辣椒酱 or hot chili paste. It is a perfect to this beautiful snack! 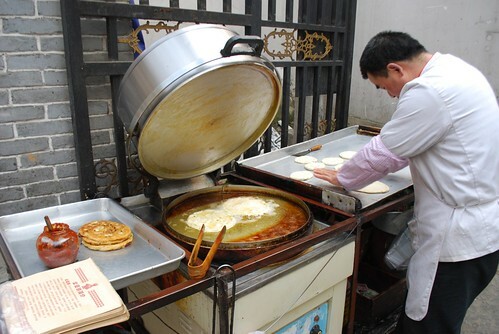 For normal Sichuan street food his cart is immaculate! The oil was fresh and clean and his cooking surface and griddle were amazingly spotless. 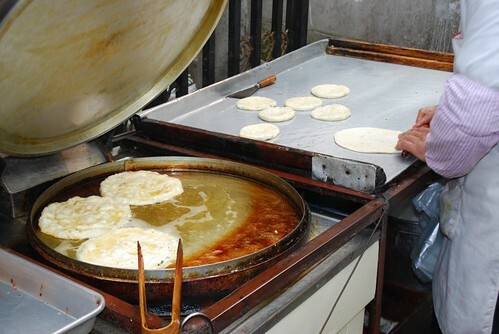 Next time I come by to have my pancake I am going to see if he can teach me how to make them along with his spicy chili paste. I can't imagine not being able to eat these when I move back to America.